Storm proxies Review 2019 - Backconnect residential proxies Tested & Is worth to buy proxies of Stormproxies.com? Storm Proxies is working hard to provide a full service for people looking for a cheap proxy provider. The variety of products and packages is one of the things that makes them stand out. We tested and rated their different types of proxies on ISP test, IP compatibility, proxy speed, proxy location.Read through expert and user reviews of Storm Proxies before you buy. We normally associate new companies with something of bad quality or not enough experience. In the case of Smart Proxies, this might not be the case. About two years ago, in 2016, a group of SEO experts founded this company. That would be a good indicator that right of the bat the founding members were people that knew what they were doing. Today we are going to review this “infant” company. Since Storm Proxies is a company that doesn’t exist very long, they don’t have a large IP pool. 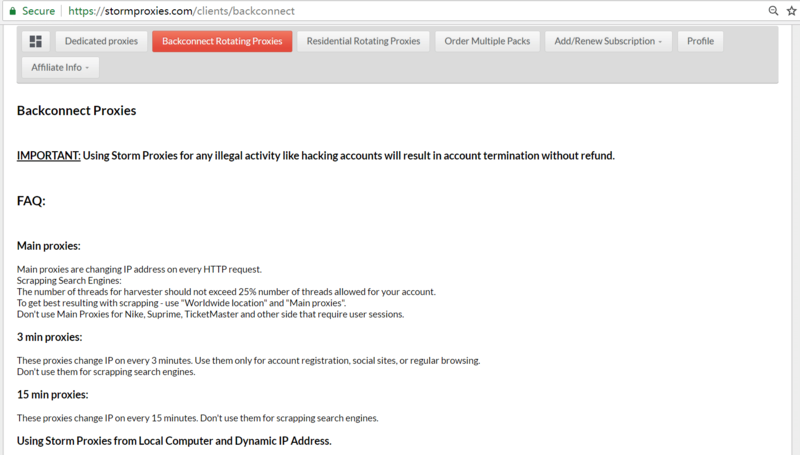 They have a little over 70000 IP addresses. Compared with other companies this isn’t a lot. When it comes to locations, they are also slightly limited. Most of those 70000 IP addresses are located in the US and Europe. They don’t provide a list of the exact locations of their proxies. We mentioned in the introduction that Storm Proxies offer three types of proxies: rotating, residential and dedicated. 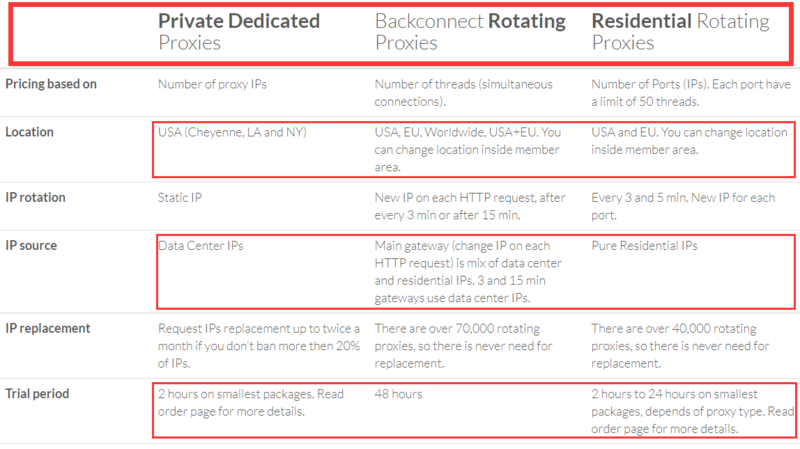 Each type of proxy has a few packages depending on your needs. This star product of storm proxies! Want to know why? 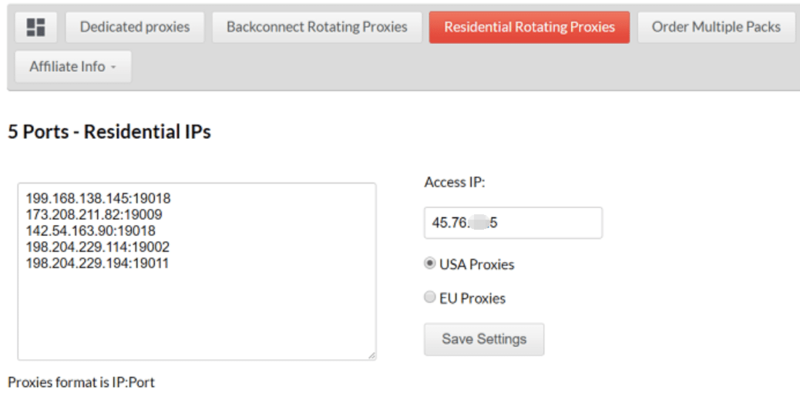 Few of data center proxies offer this type of backconnect rotating proxies! The Luminati offer same type of data center proxies shared IPs plan which pays for bandwidth, cost $0.5 per GB. Updated: Now storm proxies mixed the both data center and residential IPs for backconnect proxies. The first on the list is the backconnect rotating proxies. With these, you get proxies that can rotate with every HTTP request, every 3 and 15 minutes. When you purchase a package, you get one or multiple gateways, depending on the package. Since the rotation is done automatically by Storm Proxies’ servers, you don’t need to do anything. You enter the gateway in your browser or software, and you are good to go. These proxies are mostly used for multiple account creating, scraping and SEO. All packages come with unlimited bandwidth. You get to choose from 5 packages, depending on the number of threads (simultaneous connections) and access IPs. All packages offer 48 hours money back guarantee. Next are the residential proxies, Similarly to the Backconnect proxies ones, these are addresses that will rotate automatically. The only difference is that these are residential IPs and will rotate every 5 minutes. The procedure is the same, enter the gateway in your browser or software and let Storm Proxies’ servers do the rotation. You can use these addresses for posting ads, verifying them or access geo-restricted content. 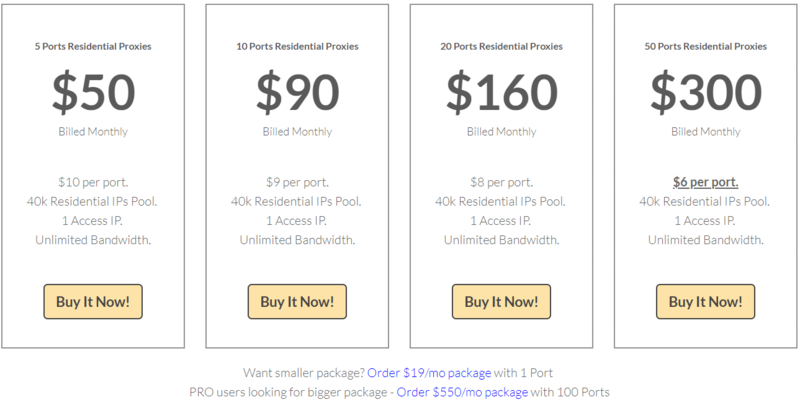 All pricing plans include access to over 40,000 residential IP addresses and the only difference between them is the number of available ports. The available locations are only limited to US and EU, so if you’re looking for Asian or North American residential proxy addresses, you might need to look elsewhere. 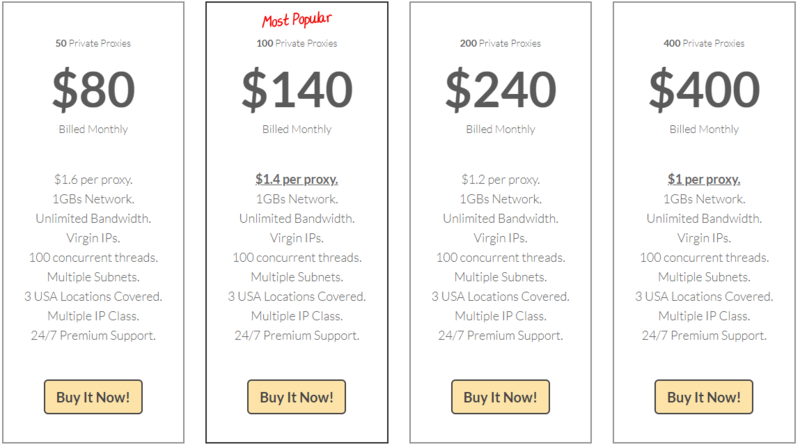 All pricing plans allow only one access IP. The proxies rotate automatically every 5 minutes. The money-back guarantee rule applies only to the smallest package of 5 ports and is valid for 24 hours. The last type of proxies are the dedicated proxies. These are data center proxy addresses where you get complete exclusivity of the addresses. What this means is that when you purchase a package with a certain amount of proxy addresses you and only you can use them. Since these are dedicated IP addresses bear in mind that they don’t rotate, instead they are static. Once you set a proxy address on your browser or software, you are “stuck” with the same one. If you want to change to a different proxy address, you will need to do it manually. The location available for the dedicated IP addresses is in the US only. You get eight packages where the bandwidth is unlimited; the locations are the same, support is premium, etc. the only difference is in the number of proxy addresses that you get for your account. If you are not satisfied with the addresses or service, you only have 2 hours to get your money back, and that applies only on the smallest package. As you can see the prices vary depending on the type and amount of addresses or threads that you need. 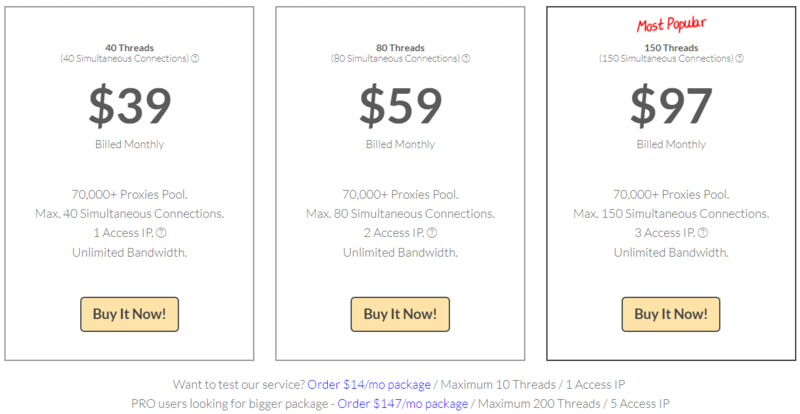 The bandwidth is unlimited for anything that you might get from Storm Proxies. All types of proxies offer a money-back guarantee. The reason why they are as short as they are is that you can use the addresses as soon as you pay. So, you won’t need to wait some time while your account is set up or activated. You pay, and you start using the IPs immediately. When it comes to authentication the rotating and residential proxy addresses can only be authenticated with a whitelisted IP. The dedicated proxies can be authenticated either by whitelisting your IP or with a username and password. To test storm proxies, We buy 5 private dedicated proxies and 5 Ports of residential IPs. You may ask me why do not buy & test their backconnect proxies? It’s easy to answer for their backconnect rotating proxies are the datacenter proxies same as private dedicated proxies! So, After getting The network performance of their dedicated proxies, you almost know the backconnect proxies works, and all the users are getting access to those 70,000+ shared IPs proxies, so It’s not value to show the network performance of this datacenter backconnect proxies in my view. Are you plan to buy dedicated proxies of Stormproxies? Check their datacenter proxies test results and read our expert review Here. We already tested & reviewed their dedicated proxies, So this review, we mainly test and show their residential rotating proxy network performance! The location is something that might put of some people away from Storm Proxies. Having a small pool of IP addresses means that they don’t cover a lot of locations. At the moment most of the addresses are in the US and EU, regardless of having worldwide addresses. Another thing that might seem strange is that fact that they don’t provide an actual list of a location like almost all of their competitors. Regardless of how much IP addresses Storm Proxies have in their pool, we still need to test them. 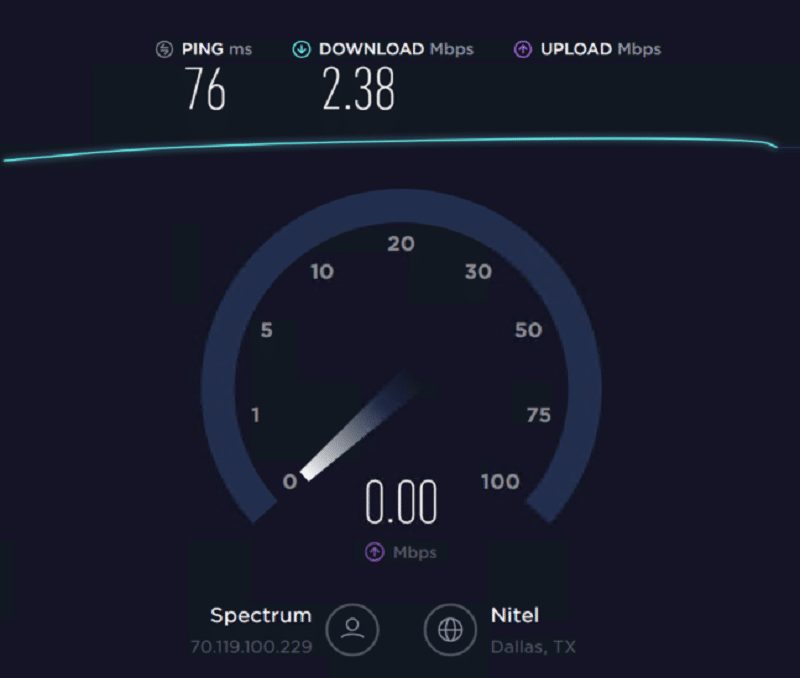 Same as with other tests we used speedtest.net to test the speed and latency. The speed of the internet connection is the amount of data that passed through each second. The latency is the time it takes for the data to reach the server and get back to the host. When it comes to residential addresses, no one should expect some record-breaking speeds. The first test that we did was on our VPS so that we have something to compare the other results to. The results of the tests that we conducted on the rotating residential proxies are in the table below. 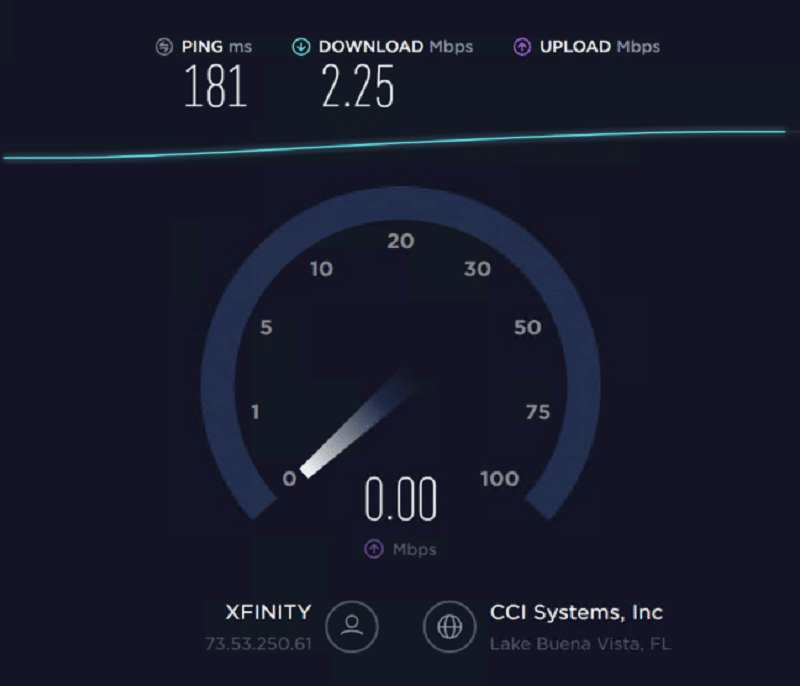 If we take into consideration that residential proxies are limited mostly by the internet connection that they have, the results are surprisingly good. Some of them showed slightly increased latency, but it is not alarming. On two of the addresses, we were not able to test the upload speed because the IP was rotated and the test was not finished. No matter if Storm Proxies offer geo-targeting or not, it is still important for the IPs to be from the claimed locations. We put their residential proxies to the test. These are results that some people might not be very satisfied with. As you can see, the last UK address is shown as a bad IP. For one of the US addresses the lookup failed. That might be because while the service was trying to look up the address it already changed. Even if we always leave this test for last, that doesn’t mean that it is the least significant one. Having proxies that can access sites that have strict rules for the type and location of the IPs is important. We have a list of a few of the strictest sites where we see if Strom Proxies’ IPs can access them. First, we tested the residential proxies. The results from the residential test are not something that you might be happy with. We already know that Ticketmaster is very strict when it comes to proxies, but in our test, only one address was able to access that website. That might not be alarming, but a residential address should be able to access these websites. Even though the only way to get in touch with Strom Proxies is by email the rate at which they respond is exemplary. All tickets are replied in less than 24 hours, and almost half of those are replied in the first hour. No matter what type of proxies or what package you get the bandwidth is unlimited. Unlike some of Smart Proxies competitors where you have to wait a little time till you can use your proxies, here that is instant. As soon as you pay for the package, you can start using the proxies immediately. You can test drive all three types of proxies that Storm Proxies offer. The money-back rules apply for all packages, and the duration is different, but it is enough to test them and see if they would work for you. If you are not satisfied, you can cancel the subscription. Storm Proxies have one of the easiest to use dashboards ever. The reason for this is because there isn’t much functionality to it. You get the addresses, some basic geo-targeting and the list of addresses that you get. There are three types of addresses: rotating, residential and dedicated. Each of them has its usage, and the documentation that Storm Proxies have on their website is detailed and easy to follow. You can get rotating addresses on each HTTP request, 3 or 15 minutes. If you go for residential addresses, you will be getting rotating addresses that change every 5 minutes. Or you can get static proxies that won’t change until you need to. That means that regardless if you need to scrape or verify ads or post ads, Storm Proxies’ addresses will work for you. Even though you might read that Storm Proxies offer IP and username authentication, that depends on the type of proxy that you purchase. The residential and rotating proxies can be authenticated only with an IP. That means that using their proxies will require you to whitelist the IP where you will be accessing them. Certain packages only offer one whitelisted IP, so bear this in mind when purchasing your package. The only proxies that offer IP and username authentication are the dedicated proxies. In each part of the dashboard designated for each type of proxy, there is a section authorized IPs. Enter your local IP address there and click “Save changes.” Once you complete this step, you will need to wait for 15 minutes before your settings are applied across the network so that you can start using the proxies. If you need a detailed description of how to use Storm Proxies’ IP addresses you can read our “How to” article. In general, there hardly is a bad proxy provider. Regardless of how small the pool of IP addresses is or how expensive or cheap the pricing might be, every proxy provider has its strengths and weaknesses. The same thing can be said for Storm Proxies. No matter if you are using proxies for the first time or you already are a pro in that field, using Storm Proxies’ addresses is easy. The dashboard is simple and easy to get around. You don’t have too many options and settings that you can change. That means that you can be up and running in only a few minutes. The prices are not something that we can estimate easily. They don’t offer thousands of IPs for each account, but the bandwidth is unlimited for all of them. That is something that you will need to decide based on your budget. We don’t have years of experience using Storm Proxies’ IP addresses. In the short time that we used them, we didn’t encounter any problems with stability or going offline at random. Support is something that Storm Proxies are good at. On their website, there is a chart of the rate at which the support tickets are handled. 45% of those are responded in one hour, and the rest are responded in 24 hours. The rate at which they respond is closely related to the complexity of the help that you need. No matter how much we try, there are still certain aspects of Storm Proxies that might not work for some. You get relatively cheap proxy addresses, but they might not be as usable as you might hope. The speeds are satisfactory and will not be a problem, but the pool of IP addresses might be a concern. Finally, if you ever get in trouble, their support staff will rush to solve your problem. Overall, Storm Proxies is not a provider that should be crossed of the list due to some things that they lack.